So this crazy idea popped into my brain, breaking up my normal "baby brain zombie like ness" the other day. It was quite fabulous! 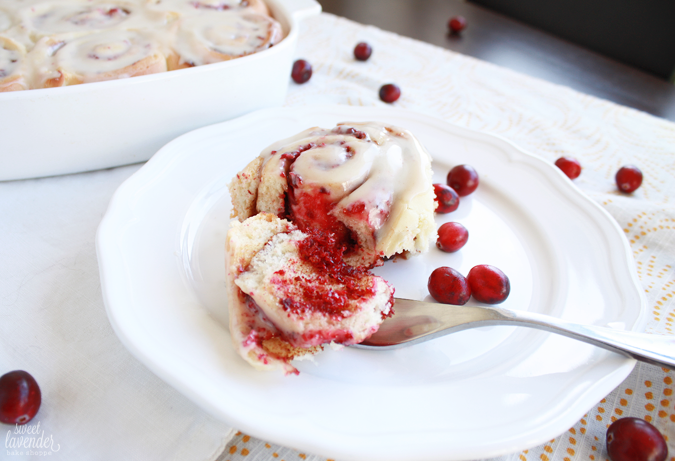 I wanted to make my husband some "from scratch" cinnamon rolls all of a sudden, but wanted to see what they would taste like with fresh cranberries mixed in somehow. I always love when the fruit comes into the stores and am always looking for ways to use them fresh besides cranberry sauce. Also, Christmas is coming after all. 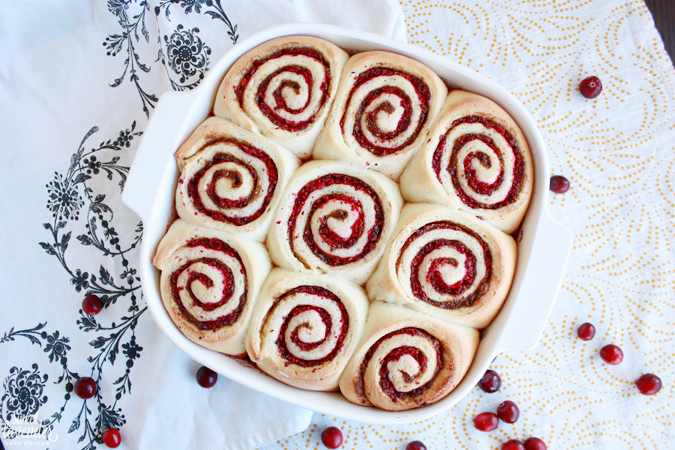 My thoughts and hopes were this: that they would be brightly colored from the red cranberries and really look Christmasie, that the cranberries' tartness would break up and compliment the super sweet of the cinnamon rolls, and sheesh- that they would be edible! So I waddled myself to the store, picked up a baggie of the fresh fruit and got myself back in the kitchen to test out my hopes and dreams in cinnamon roll form! Success!!!! Success to the freaking max guys. 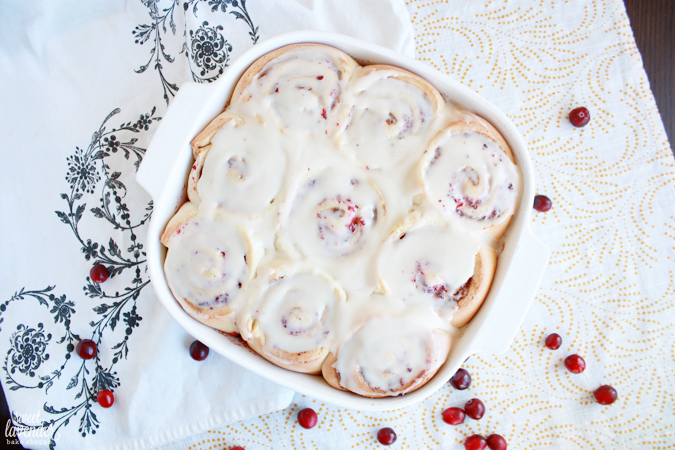 It's everything you want in a cinnamon roll- fluffy layers of gooey breadiness intermingled with cinnamon and sugar. But then the cranberries kind of give you a little, "How you doin'?" and wake up those warmer toned taste buds! Not too tart and not too sweet, these guys were amazzzzing. Plus, I paired it all with browned butter icing instead of the cream cheese frosting because I thought a nice warm, nutty buttery topping would pair nicely. And it did. 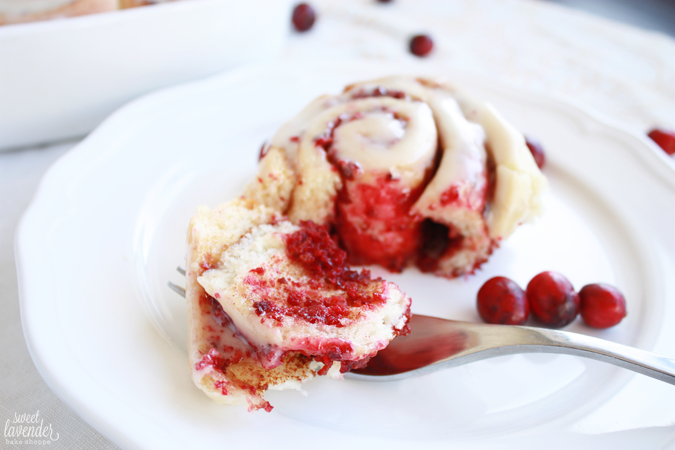 The almost toffee like flavor totally loves to be dripping down the cranberry filled layers. Like a Christmas party in your mouth. In a really delicious way. 1. In a small saucepot, add the milk and butter. Gently warm over medium low heat until the butter is melted and your mixture reaches 110-115° F. You want the mixture to be warm but not hot. Definitely not simmering or boiling. If it's too warm, allow to cool to 110-115°F. 2. While that is warming, sift together the flour, sugar and salt. Set aside. 3. Into a stand mixer bowl, add the warm milk mixture and the packet of active dry yeast. Mix together well with a spatula or fingers. Allow to sit 1-2 minutes. Next, add the flour mixture and egg and beat with the dough hook attachment on medium to medium-low speed until combined. If you notice your dough is sticking to the bowl, you can add additional flour in small increments- not exceeding 1/2 cup more flour. I did need about another 1/4 cup. 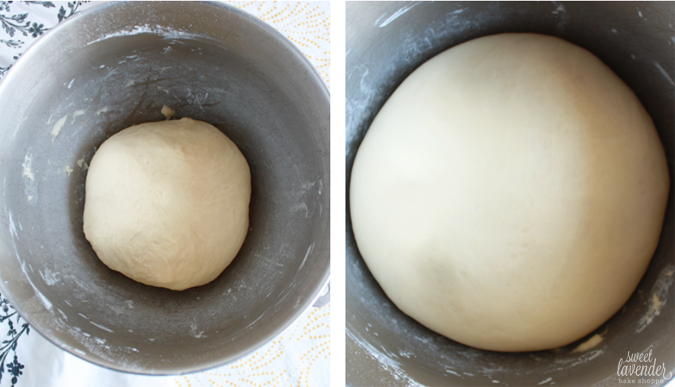 Allow the dough to form into a ball and pull away from the bowl. Continue to "knead" the dough on medium-low speed for 5 minutes. 4. Once dough has kneaded, remove from mixer, remove dough hook, pick up dough with hands and form into a ball. Place back into your bowl, cover with a tea towel, and set in a warm part of your kitchen to rest and proof until doubled in size- about 40-45 minutes. 1. While your dough is resting and proofing, mix together the cinnamon, brown sugar and vanilla sugar into a bowl Set aside. 2. 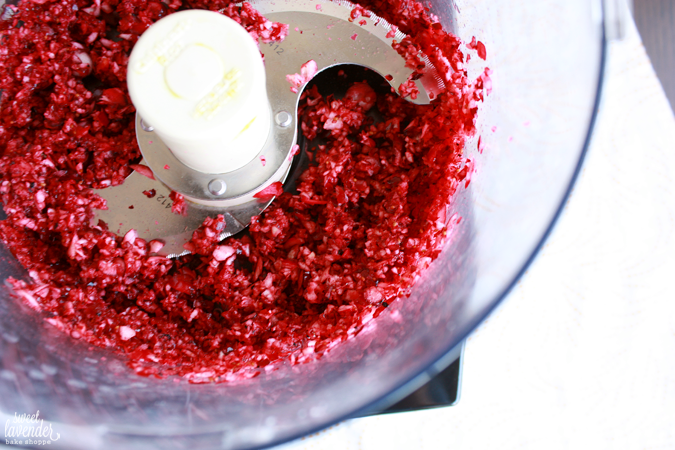 In a food processor (or you can do this by hand with a knife as well) add the fresh cranberries. Pulse until they are very finely chopped but not pureed. Place into a separate bowl and set aside. 1. When the dough has proofed and doubled in size, remove from the bowl and place onto a lightly floured surface. 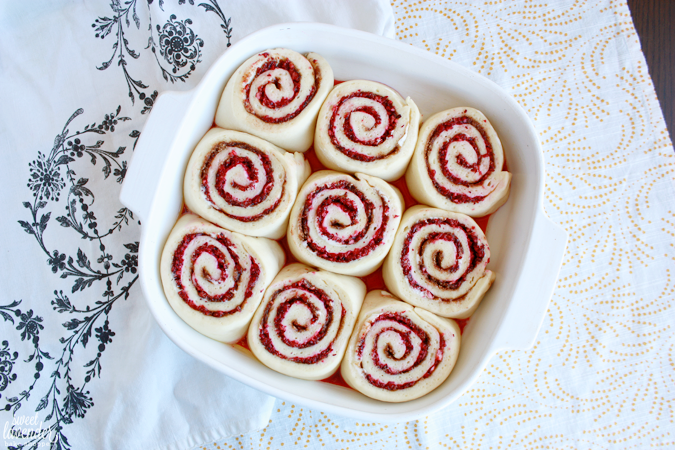 Roll out dough into a rectangle that measures approximately 14x20". 2. Next, take your softened stick of butter and spread out evenly all over the surface of the dough, leaving a 1/4-1/2" of unbuttered dough along one side of the 20" side. 3. Sprinkle the cinnamon sugar all over the buttered surface and smooth out evenly with your hands. 4. Finally, sprinkle the finely chopped cranberries over the cinnamon sugar so it's a nice even layer. Be careful NOT to get any of the cranberry liquid that might have accumulated while sitting. 5. 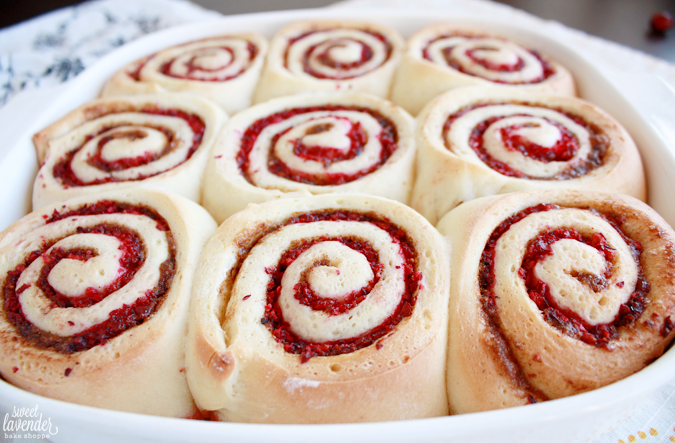 Beginning with the 20" side that doesn't have the 1/4-1/2" blank dough, tightly roll dough over itself and continue until you reach the unbuttered and sugared space. 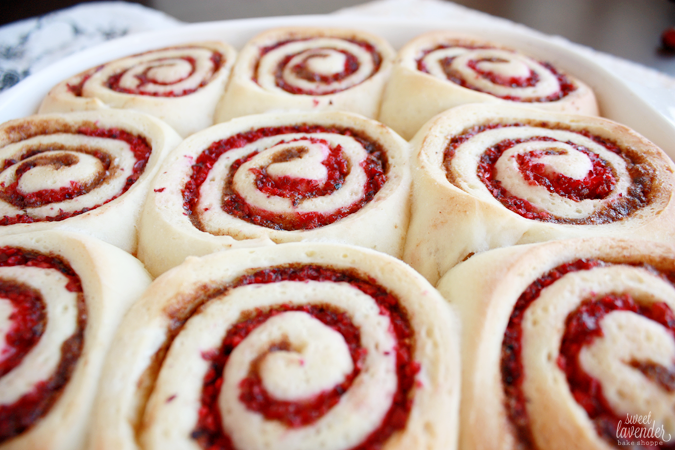 Pinch the end of that unbuttered dough into the roll sealing and closing up the entire thing. Turn roll so that it is seam side down. 6. Using a sharp serrated knife, cut the roll into 1 1/4" wide slices. I got about 14 good slices out of it. 7. Lightly grease a 9x13" baking pan, two 9" cake pans, or whatever you're wanting to bake these babies in. Place the cut slices into that greased pan with a little space in-between. They will rise and puff so you'll want to give them room to do so. 8. Cover pan(s) again with your tea towel and allow to rest and proof one more time in a warm part of your kitchen. You're looking for them to have swelled and puffed, about 30 minutes. 9. Preheat oven to 350°F and make sure your racks are in the center of your oven. 10. Once rolls have proofed the second time, place into the preheated oven and bake for 30 minutes or until rolls are golden brown and cooked all the way through. 1. While the rolls are baking, melt and brown your 4 tablespoons of butter. 2. Whisk together the browned butter, powdered sugar, sea salt and milk until a thick but slightly pourable icing forms. You may need to add a touch more milk to achieve this. You're wanting the icing to resemble the texture of a cream cheese frosting. 3. 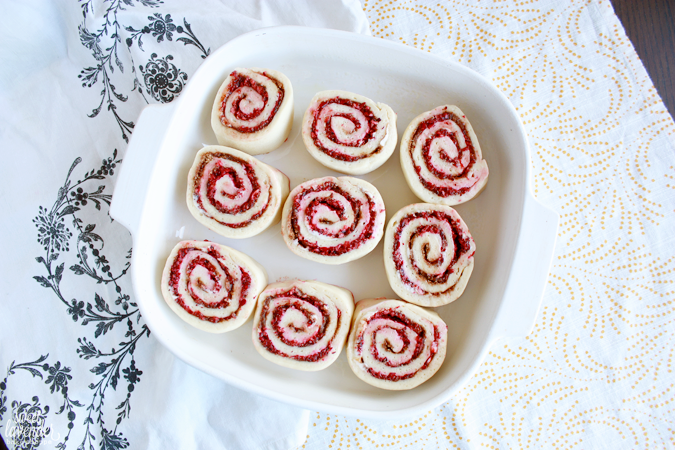 Once the rolls are baked, allow to rest 5 minutes before generously spreading the top with your brown butter icing! 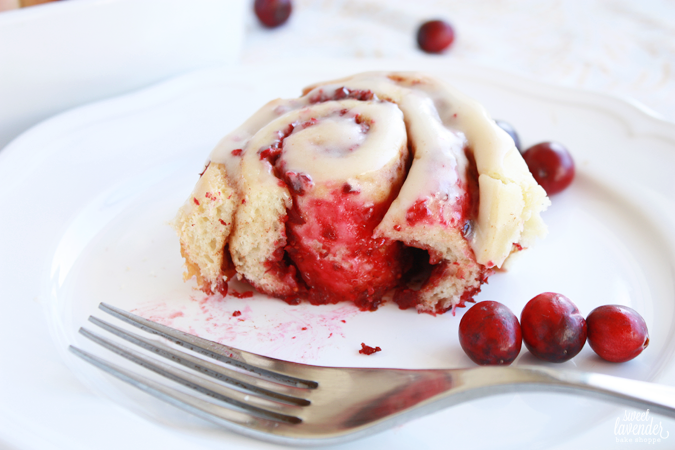 Cinnamon Roll's world just got bigger. These look gorgeous! Perfect for the holidays! Pinned!